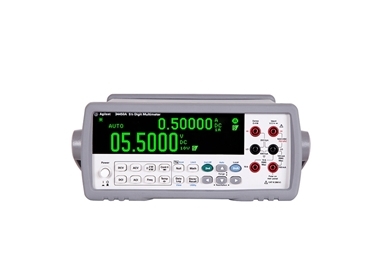 Agilent Technologies introduces the 34450A 51/2 digit benchtop digital multimeters designed to turbocharge electronic test and measurement applications for industrial and educational use. One of the fastest benchtop digital multimeters in its class, the Agilent 34450A is capable of measuring up to 190 readings per second with 0.015% DCV accuracy. Multiple connectivity options, including USB 2.0, serial interface (RS-232) and general-purpose interface bus (GPIB) give users greater flexibility when transferring data to a PC for analysis.